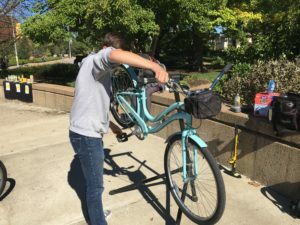 The Bike Resource Center provides free bike repair to MU students every Monday, Wednesday and Friday from 11 a.m. to 2 p.m at Speaker’s Circle, assuming the weather is above 55 degrees. It is one of the programs promoted by the Sustainability Office. The bike repair was made available to students in 2012, after it was formed by Student Life staff members in 2010. It came under the control of the Sustainability Office this past fall, following a merge with the Environmental Leadership Office. This merge is due to campus wide budget cuts. MU Sustainability Office Program Assistant Ashley Craft discusses how the program has changed since it has been under new management. “We’ve been able to [promote] it, and we hope it continues to grow under our guidance,” Craft said. 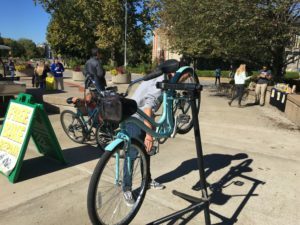 The Sustainability Office also provides a free bike share to students as well as a farmer’s market in the fall and the spring. Students can rent a bike for free from either the student center or Brooks Residence Hall for 24 hours. The farmers market takes place every other Thursday at Lowry Mall from 10 a.m. to 2 p.m. Craft says there is a greater message the Sustainability Office wishes to send though programs like the bike repair, bike share and farmer’s market. The Sustainability Office promotes different events throughout the year to represent minority groups on campus, such as the LGBTQ community and the MU Disability Office. Craft explains what the purpose of the sustainability office is on the MU’s campus. To find out more information, visit sustainability.missouri.edu or follow the Sustainability Office on Twitter and Instagram @MUSustainOffice and like MU Sustainability Office on Facebook.